I enjoyed reading this, David. I’ve never made a trip like that in heavy snow but I have in heavy rain northwest of Ft. Worth. I couldn’t stop – I didn’t want someone who thought I was on the road to hit me and and I could see only a few feet in front of me. You got some nice photographs of fresh snow. I really like the last with the rabbit tracks and the grass/brush shadows. Very well done, David. I mostly shoot in landscape orientation and occasionally will shoot a vertically oriented shot. Other photographers I see are just the opposite. It was interesting for me to look at this set of yours and consider your point of view. Hi Sharon, I appreciate your feedback. A compliment coming from you has meaning to me. Now I’m glad I included the Rabbit Tracks photograph. It almost didn’t make this blog post. Believe it or not, I too mainly photograph in landscape orientation. I didn’t realize until after I added the photographs to this blog post that they were all verticals. Sounds like it was quite a trip. I’ve been caught in a few of those winter howlers in eastern Montana and the Dakotas. They’re not easily forgotten, and I enjoyed reading your account of this one. Love the photos too David. Very good work. I appreciate your participation, PJ. Indeed, that sort of winter storm is good for us humans. It reminds us how powerless we are in the face of nature. Angular boulders is quite good if you ask me…. I like it a lot! And I’m happy to see you breaking at least one of the “rules” of photography by shooting into the sun rather than setting it at your back on the two in the middle – and you did it quite nicely as well! All around good stuff, so glad to see some of your own work here from time to time. Thanks, Derrick. Some of Dad’s best photographs are great because they are backlit. 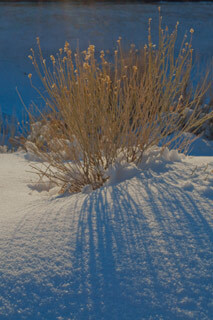 Backlighting is one of the keys to quality landscape photography. Whoever said photographing with the sun behind the camera is a rule of photography shows you just how misguided people are who make up, write down and teach by rules, guidelines, pointers or lists of any kind. Learning to see has nothing to do with all of that rot. I too really like these images, David. 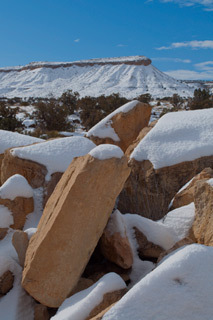 The first one, from the San Rafael Swell really brings me into the scene, and I can imagine trying to find a dry place to sit as I soak up the afternoon sun. 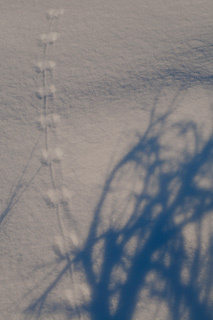 The rabbits tracks make a great abstract image. Having lived in the Rocky Mountain West, and now in southern California, I realize how much the lives of people in the west are governed by the weather. Living down here now, I don’t think a thing about planning a trip, often completely disregarding the weather. However, when I lived in Wyoming, the story was different. A sleeping bag had a permanent place in my Subaru station wagon, because honestly I never knew if I’d get stuck in an unexpected snow storm. I always wondered why my grandmother, who spent her whole life in Wyoming and North Dakota, focused on the weather, but its because it has always had such an integral role in her life. In the winter, it ruled travel plans, and in the summer it could make or break a crop. What a tenuous line to walk. This is a really great post…thanks for sharing the images and the virtual tour. Hi Greg, thank you for your stories about weather. People often make fun of talking about it. I sometimes say that I take pride in not being influenced by the weather, but I still am more often than I like to admit. Being aware of and working with the weather can be a matter of life and death, especially in the winter in some places including the high desert and many of the mountainous Western states, as you eloquently point out. Hi David, here I am again. First I only looked at the charming photographs of a desert dressed in a beautiful white robe. Now, having enjoyed your text I must thank you for guiding me with your words through that wonderful country I have never seen, but I hope to visit someday. Hi Peter-Cornell, very glad to hear from you on this forum. I have missed you and am glad you are back. Please look me up when you do get a chance to visit the Western U.S. Did you notice? I hope you don’t mind, I put a link to your site under “Fine Photographers” under my “Blogroll” on Landscape Photography Blogger’s sidebar. Hi David, I appreciate the time you took to write & post your photos of your travels. I especially enjoyed your simile at the end of the 2nd paragraph. 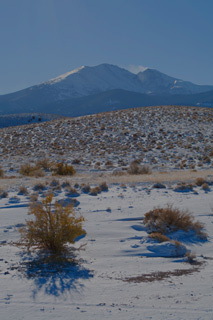 The last 3 photos really helped me feel the desolate beauty of the fresh fallen snow. I’ve always appreciated the beauty of the desert. Some see it as barren, I’ve always relished the colors, and shapes of its landscape. Although most of my car travels are not in the dead of winter, I can definitely relate your story to many of the adventures on the open water crossing the 26 miles from Long Beach to Catalina Island in all types of weather conditions. Ask me about the hurricane crossing one time. Another well written post and images. It sure did stir up memories of past trips for me and stirs up the desire to venture off on more. Since I live in Fort Collins, I have also driven west up through the Poudre Canyon and into Vernal, Utah. I enjoyed that route also. Nancy, I appreciate you commenting here as there probably aren’t too many Yoga or Tai Chi students reading my blog that might visit your website. Nonetheless, my readers may find your work interesting. I look forward to hearing your stories about crossings to the Catalina Islands. I grew up sailing and know how adventurous and often downright dangerous it can be even just on lakes, let alone on the Pacific Ocean. Lake Almanor can often get three to four foot waves on the East Shore, which can swamp and sink a small boat like a Sabot or an International 14 in no time. Monte, you’ve said you are a regular reader here, but as you don’t comment as often, I especially appreciate this one. In reading your blog posts, I understood you had moved to Colorado, but I must have missed the blog post in which you said you had moved to Fort Collins. WELCOME! I’m in California right now, but we’ll have to get together when I get back to Colorado. I don’t know if you like to photograph with others, but we ought to go photographing in Denver, Boulder, Fort Collins, Rocky Mountain National Park or wherever. I know some good places for street photography and for landscape photography. I am also eager to find new ones. When you drove to Vernal, Utah, did you travel on into Dinosaur National Monument? Thank you so much, dear David, it is really an honor to be allowed to find myself sitting between these excellent photographers! Hi Peter-Cornell, it is an honor and interest for us and them to be joined by a landscape photographer like yourself from another part of the world with a different perspective of nature and photography. No, I did not get a chance to go up there but it’s on the list. Dinosaur National Monument is one of those places that is challenging to photograph, at least from the main roads. The best scenery is only accessible by 4X4 vehicle, well off the beaten path. Echo Park is accessible by regular car, but it is a fairly long drive on dirt roads. Echo Park is also a tricky place to escape from when it rains and the road turns into the West’s famous desert axle grease. The best landscape photographs of Dinosaur I have seen from recent times were photographed from boats on the Yampa River or Green River. River rafting is the best way to see the most interesting and dramatic scenery of the river canyons. Nonetheless, even what you can see from pavement has a powerful, haunting quality that is unlike any other land on Earth. Dinosaur is an empty, lonely windswept national monument. It is well worth seeing even if you only have an extra day or two. I would have to say that desert images with snow, and desert images with wildflowers are both more memorable to me because they challenge our preconceptions of deserts being lifeless and barren. I sympathize with anyone having to travel through some of the storms you describe. I particuarly like the long, reaching shadows of your Juniper tree shot here. Thank you, Mark. My team and I nearly chose Dad’s landscape photograph in Joshua Tree National Monument of snow on Joshua Trees for this year’s new release for that very reason. It seems almost counter-intuitive to see snow on Joshua Trees, or any other desert plants or land formations. It also seems much smarter to be swimming around in the tropics making underwater photographs as you do once in a while during the winter, rather than plunging through snow drifts using my poor truck as a submarine as I have. I suppose I will make a different choice some snowy winter. In the meantime either adventure makes a good story later. 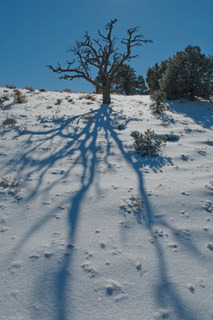 Juniper Tree photo is my favorite as well -= the long shadows really create a sense of depth, as well as conveying the idea that these trees have seen much more than we have and belong in this environment. Great story which reminds me of many a late night drive in a snow storm just hoping to get to my exit, and safety asap. Thanks for sharing David. Thank you, Robert. I am grateful for your feedback.